Pilsen has been a mecca for the Mexican muralist movement. A geographically isolated part of Chicago, Pilsen’s boundaries, from the Chicago River to the railroad viaducts, have become canvases for the growing effort to maintain vibrancy and culture within the predominantly Mexican neighborhood. Pilsen’s buildings, alleyways, and even doors are places where artists blend their identities and culture to convey the injustices they face daily. 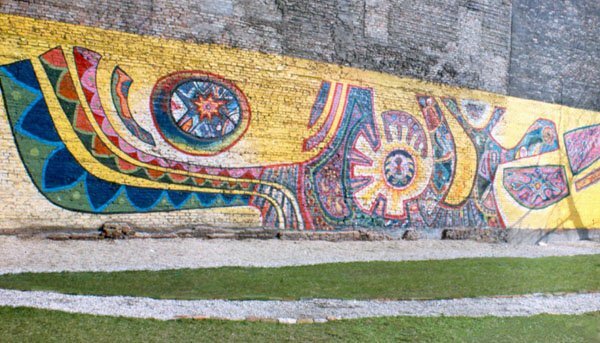 Murals have a strong history in Aztec and Mayan cultures. Their historical influence spread from Mexico in the 1920s and ’30s as government-funded projects to educate the public. That spirit migrated to the walls of Pilsen in the late 1960s and ’70s, becoming a voice for the people. In 1968, Mario Castillo painted Peace or Metafisico on the side of the Halsted Urban Progress Center at 19th and Halsted Streets while a student at the Art Institute of Chicago. 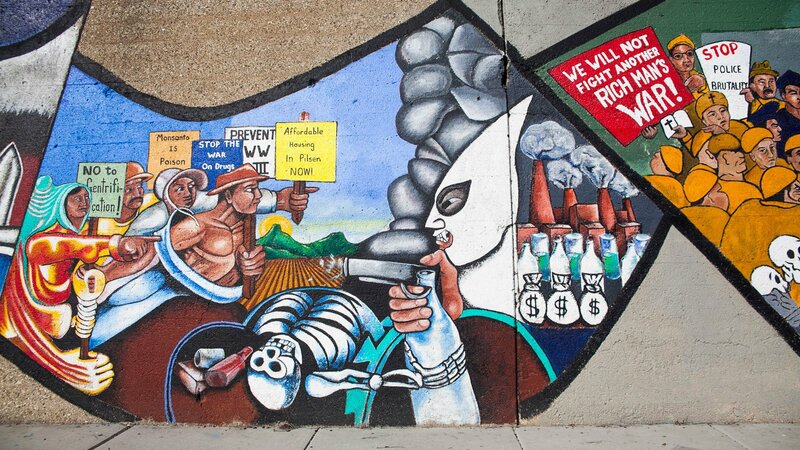 It was the first Mexican mural in Pilsen and one of the first anti-Vietnam War murals in Chicago. Castillo has said that it was an attempt to give validity to the Mexican identity, since he felt it had been negated. His passion grew; just two blocks away and one year later he painted The Wall of Brotherhood, a multicultural student piece that drew its inspirations from African-American muralist William Walker’s 1967 Wall of Respect in Bronzeville. From there, Castillo started teaching at Columbia College	where he worked with and taught several other Pilsen-based muralists. Along 16th Street are a series of murals that stretch for almost a mile and date back decades. The oldest of these murals, on the corner of Blue Island and 16th Street, is Galeria del Barrio, painted in 1976 by Aurelio Diaz with 20 children from St. Procopius Church. In it, 22 male profiles show the dramatic evolution of emotions, ending with a depiction of a fetus. Over the years, the murals have been extended as community groups and organizations collaborated with artists to beautify the neighborhood. In recent years, artist Sam Kirk worked with the Chicago Public Art Group to restore the mural and to keep past works and cultural history intact. 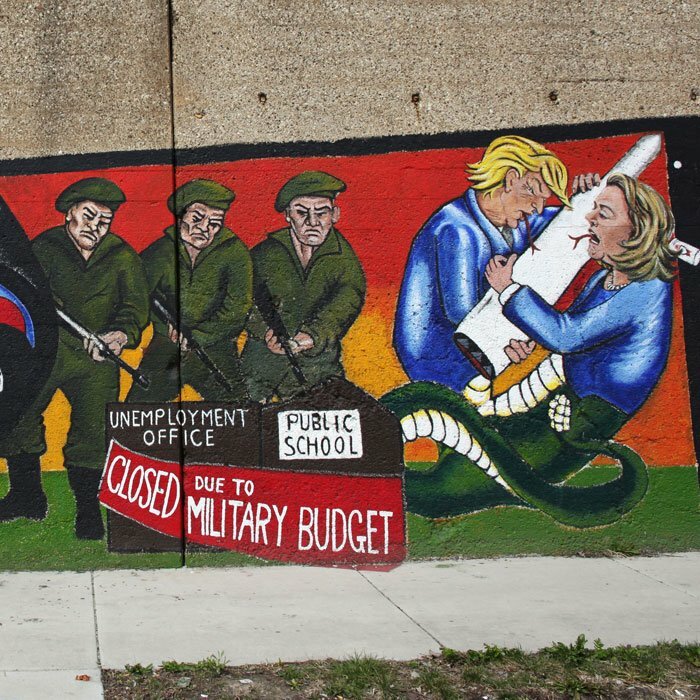 In 1980, more than 10 artists from the North, South and West Sides of Chicago collaborated on a provocative anti-war mural organized by with the Chicago Public Art Group entitled Prevent World War III. Marcos Raya created one of the most well-known segments of the mural, “Fallen Dictator,” illustrating a massive statue of U.S.-supported Nicaraguan dictator Anastasio Somoza toppled by working and middle-class rebels waving Sandinista and Che Guevara flags. The mural bridges the gap between the neighborhood and the rest of the city with a highly politicized anti-war and anti-imperialist message. Other contributors to the mural included Carlos Cortez, José Guerrero, Celia Radek, Gamaliel Ramirez, Rey Vasquez, and Roman Villarreal. “The artists painted the murals because there needed to be a consciousness about our neighborhood and culture,” Raya said. Ironically, Somoza was assassinated only days after Raya finished painting his portion of the mural. The mural was created during the 1980 election, in which Ronald Reagan faced incumbent President Jimmy Carter. Since its creation, the mural has been updated three times, most recently to add references to the current political climate, with new imagery of President Donald Trump and Hillary Clinton. “We have Trump on one side and Clinton on the other, and both are talking the politics of fear and war,” Raya said this summer while updating the mural. 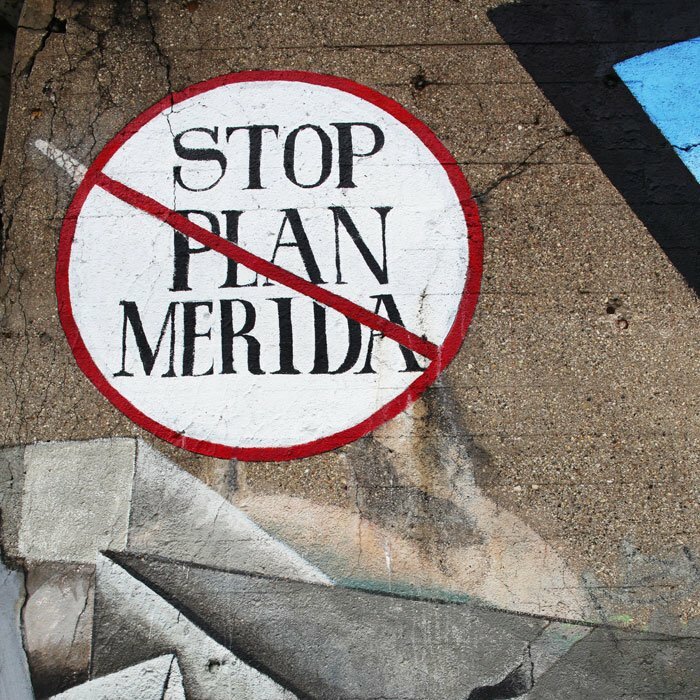 He has also added signs depicting working-class immigrants and the words “Stop Plan Merida,” a reference to the agreement between the U.S. and Mexico that Raya says has served to escalate the drug cartels’ violence and corruption. American Painting is a contemporary story depicting ideas such as human value, currency, and stereotypes. The praying hands, the coin, and the bald eagle all have their basis in the formation of the colonial United States. The praying hands represent religion, the U.S. coin represents capitalism and commerce, and the bald eagle represents patriotism and nationalism. The background of the painting is made up of three homes typically found in many American cities and suburbs. The idea of home in the painting is multi-faceted and depicted with larger-than-life theatrical structures. 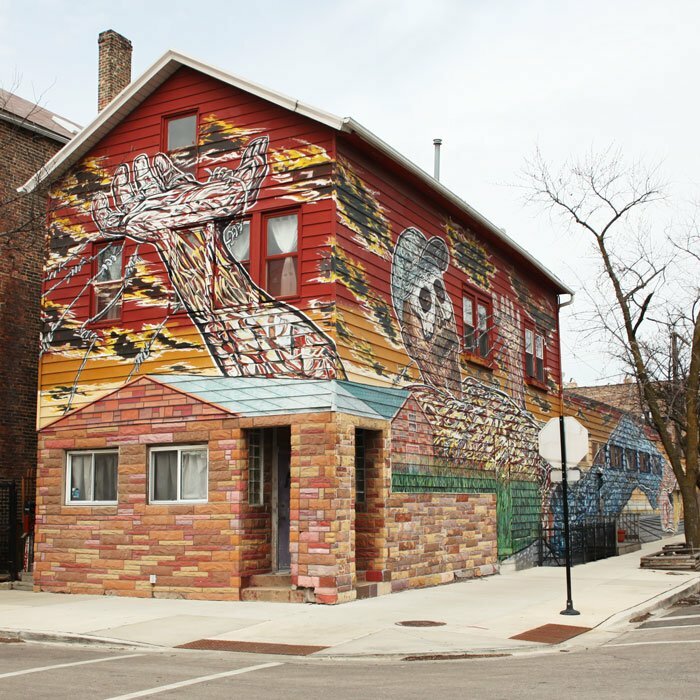 The homes in the mural were directly influenced by the architecture found in the community of West Pilsen, Chicago, IL. The skyline and rooftops are cubist in style for aesthetic purposes. The perspectives of the rooftops are seen from a bird’s-eye view, creating multiple points of view at one time. The rooftops become unidentifiable rooms and surfaces depicting the notion of beyond or internal and external spaces. In 1997, Yollocalli Arts Reach was started as a way to educate youth in Pilsen and to provide opportunities for fellow artists. Yollocalli participants have created more than 30 murals throughout Chicago. 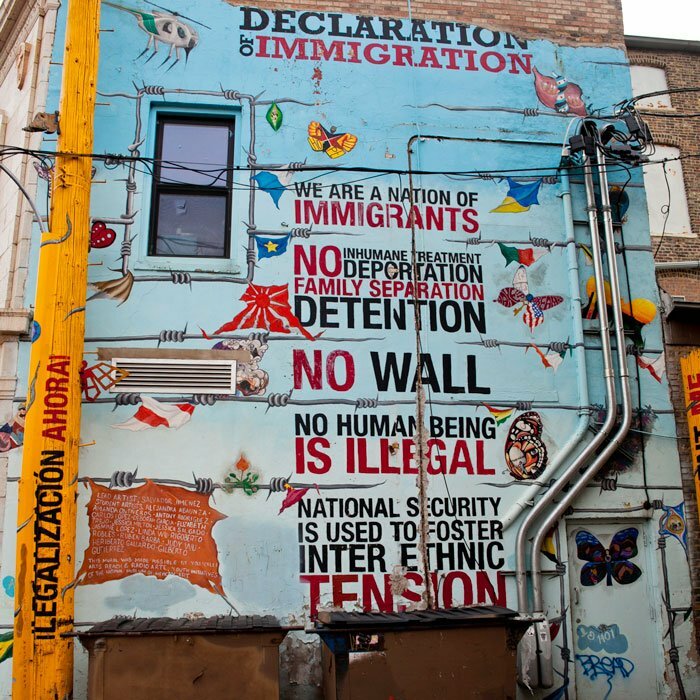 One of their most noteworthy murals in Pilsen is The Declaration of Immigration. The mural is “a visual dedication to all immigrants and allies who have marched hundreds of thousands of miles to advocate for fair legislation for immigrants and who have stood strong in the face of anti-immigrant rhetoric.” It remains on the former home of the group, now a Giordano’s, while the organization has since relocated to a site in Little Village. 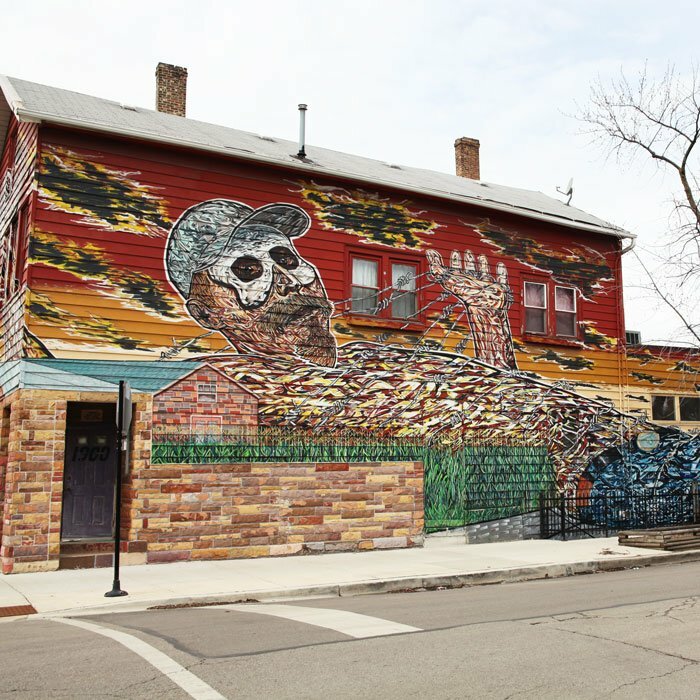 In 2005, the prolific Pilsen muralist Hector Duarte covered the exterior of his home studio with a larger-than-life, 3,000-square-foot mural depicting the travels of Gulliver – but with a twist. The character is an outstretched Mexican immigrant who is struggling to break free of the barbed wire that binds him. Gulliver in Wonderland is now a Pilsen landmark and a quintessential character within the neighborhood. Duarte’s work focuses on identity, borders, migration and freedom. Born in Michoacán in 1952, he moved to Chicago in 1985. 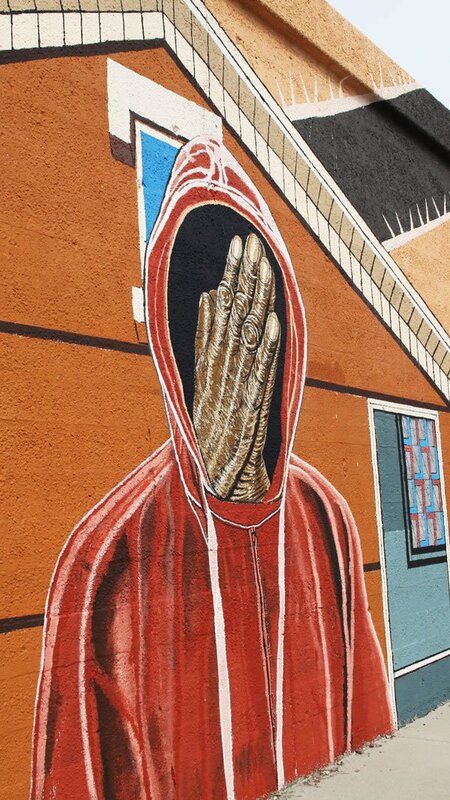 Duarte prefers murals to other art forms because they have the potential to reach a larger and more diverse audience. He has created more than 50 murals within the Chicago metro area and has worked with many educational and arts organizations, including the Chicago Public Art Group. Jeff Zimmerman, a Chicago native, uses different iconic references, saturated colors, and poetically crafted faces in his large-scale murals. Using a diverse group of people and imagery, he creates noteworthy historical and political pieces. 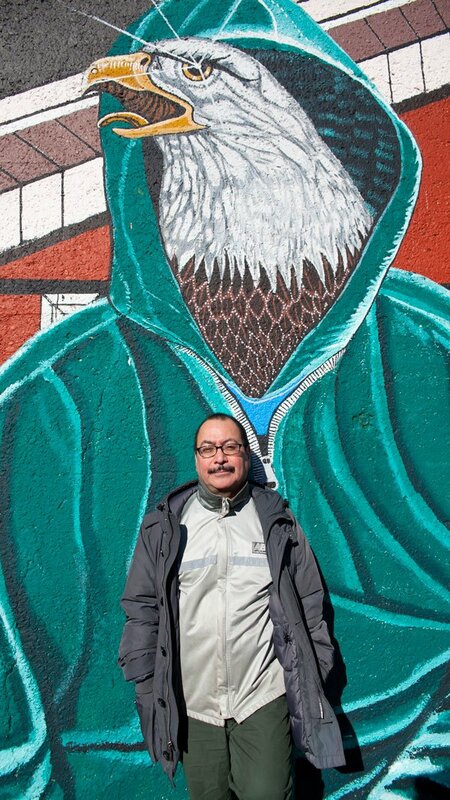 Although his work can be enjoyed throughout Pilsen, a cluster of his murals are near St. Pius, depicting the struggles of immigration and the inspirational faces of past and current residents with “Si, se puede,” translated to, “Yes, I can,” as a way to continuously motivate community members. 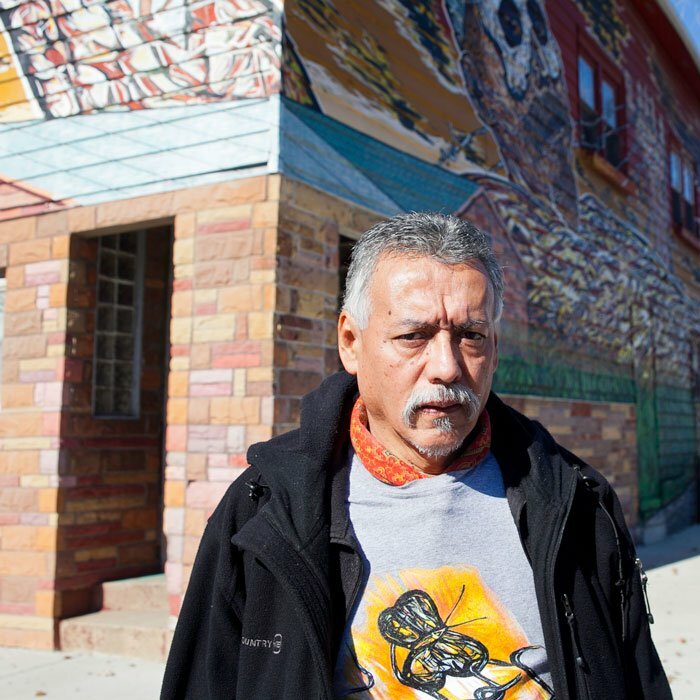 Jeff Maldonado has been a fixture in the artist community in Pilsen for decades. He studied under Mario Castillo and has worked alongside many of the greats, devoting much of his time to teaching and creating. His work sits alongside that of Duarte, Castillo, and Rayas in the National Museum of Mexican Art. After the sudden, tragic death of his son, Jeff Jr., he worked with high school students in his after-school program, J-Def Peace Project, to paint a mural that soon evolved into a mosaic masterpiece. Maldonado has worked to revive the Mexican muralist movement in Pilsen and, since launching the J-Def Peace Project, has worked with more than 900 youth. Across the street from Aurelio Diaz’s Galeria del Barrio is Sam Kirk’s Weaving Cultures, created in collaboration with Sandra Antongiorgi and the Chicago Public Art Group in 2016. In contrast to the emotional male faces across the street, Kirk and Antongiorgi’s work displays five vibrant faces depicting women of different ethnicities, ages, and backgrounds. The artists explain that they depicted a transgender Latina, as well as other underrepresented demographics, in the hopes of provoking a dialogue about unity and acceptance. 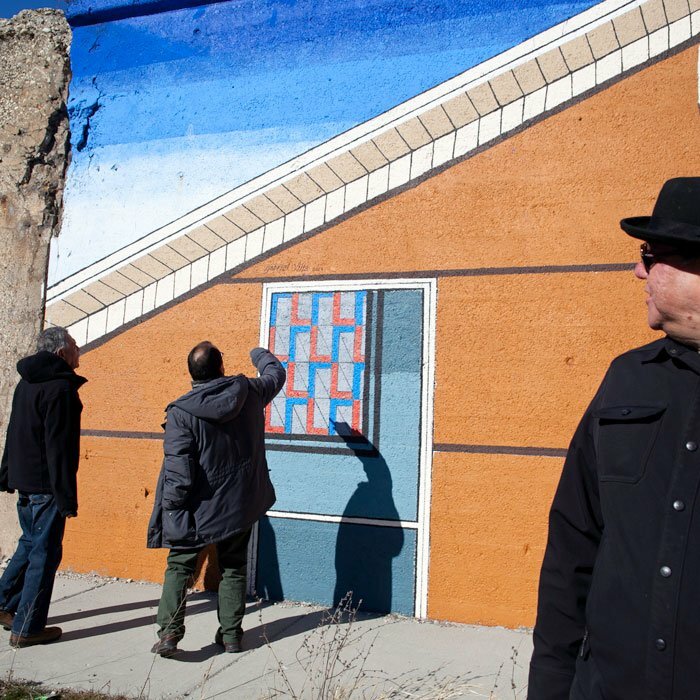 “This community is changing, and it’s evident by the type of murals being painted,” he said. Throughout the decades, art and murals have breathed new life into Pilsen and made art accessible to everyone. 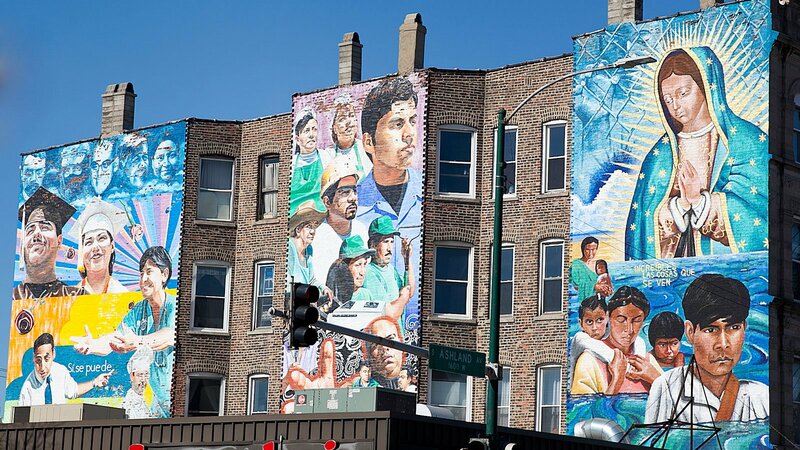 Clusters of murals are reminders of the gallons of paint and hard work put in by countless volunteers and organizations, including the National Museum of Mexican Art, Yollocalli, the J-Def Peace Project, and the Chicago Public Art Group. Decades of weather-worn walls have been given a new coat of paint. From politically driven pieces updated to show current struggles to faces of young people lost far before their time, it is a reminder of the resilience of the neighborhood and the community of people who have made Pilsen what it is today.